Caught in the act of creating The Big Debacle! In April 2009 I had the great pleasure to interview Bob Frankston for an hour or so. Bob has an amazing scope of involvement in innovative computing in the past fifty years as you will hear from the interviews below. Of course Bob is perhaps best known for creating Visicalc working with Dan Bricklin in 1978. But we then hear (in part two) how Bob both wrote Visicalc which was the high octaine of the 1980s Wall Street shenigans and created the code for Long Term Capital Management, the huge hedge fund that blew up in the late 1990s and presaged the 2008 global financial meltdown. So it turns out the horrible truth is that Bob created the tools that created the modern financial world, just in time for the BIG DEBACLE in '009-'008, thanks Bob! Interview Part One: from his beginnings at Stuyvesant High School Brooklyn, NY, then his career through the 1960s, 1970s and later. Mentions Multics project, Unix, Butler Lampson, having a high draft number, took accounting course, language wars, Project Mac at MIT, Ethernet as Bob Metcalfe's class project, visit to Xerox PARC in 1971 (some kind of bit-mapped system demo by Butler Lampson), Interactive Data, Imlacs, playing Peek at MIT (Maze War), Licklider, TJ Watson Research Center in 1965 working on the 1130, VM, script and nscript, and much more arcane stuff. Interview Part Two: How Bob converged all these streams to write Visicalc with Dan Bricklin in 1978. 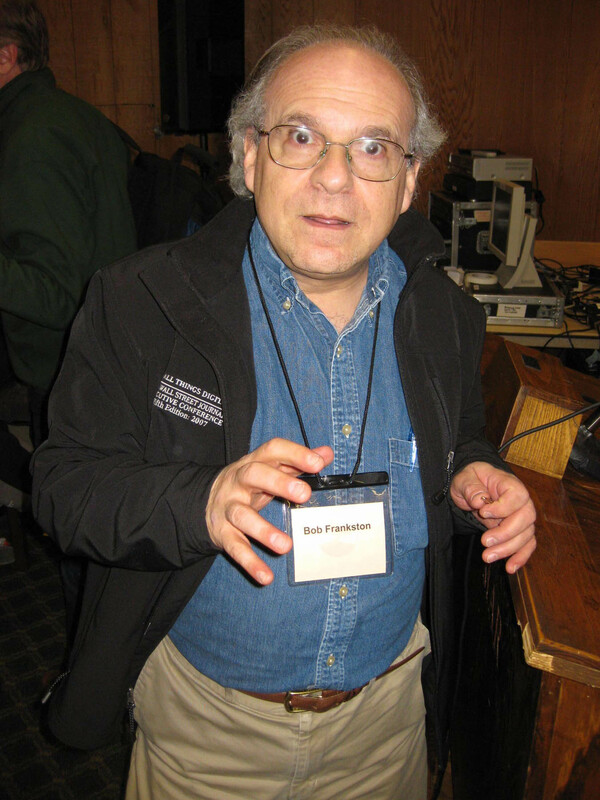 In this segement Bob talks about the IBM 2250 graphics computer, how he met Andy Van Dam, many other threads, the precambrian explosion, 940 QED commands, LISP, LINC/Wes Clark, Alan Kay, Utah people, E&S system at MIT, Peter Bishop, meeting Dan Bricklin in 1970, PROFS (IBM Office System), HLAPI, 3270, VT/100 character mode and acoustic click sound, DEC Rainbow and Robin VT/180, a lot happened before VisiCalc, Dan on Multics, LISP, APL, VisiCalc programming on the Apple II, Emacs screen experience, TMacs, Stallman's contribution, birth of Emacs, Teco (which one? ), Multics QED became Unix ED, Bill Joy did screen editor, Bernie Greenberg & LISP, all flows together: screen editing, macros, compiling on the 6502, BASIC on ECD machines, Visicalc was written in 6502 assembler, writing small code, working at SDS 940, Twinex, PDP/10, PARC MAXC, 940 OS, BASIC for TI 99/4, home finance program, architecture machine group at MIT, heads-up display, FFL - first financial language in the 940, Bill Pentz' MainCalc vs FFL and Visicalc, Long Term Capital Management, design decisions, John Sculley Pepsi Challenge, Carl Helmers' review (see our Carl Helmers interview), Mitch Kapor becomes product manager at Personal Software (Visicorp), not becoming gazillionaires, Milliken blamed them for the 80s and the birth of derivatives, supercalc, lotus etc, Visicalc took off because doing math is highly leveraged, sold to the people with money, and investors, Visicalc giving people the illusion of certainty, hedge funds are perpetual motion machines, Interactive Data guesstimates, Trillions flying around because of Bob, accidental being in the middle of the picture, I didnt know how nefarious these guys are, Phillipe Khan understood that the purpose of a spreadsheet is CYA, its all about presentation and about telling stories, the ability to tell bigger lies, Penn & Teller, precise calculation is totally meaningless, that is called economics, GIGO (Garbage In Garbage Out), evolution and digital processes, curves, Moore's law, and market configurations, scale-full, how evolution works and markets work creating opportunity and then following it, we are in the BIG DEBACLE, confusing statistical success with individual success, future is intrinsically unknowable, esp because of co-evolution, the PC was a wonderful risk-taking machine, can be used to destroy the world, the Maginot Line. Bob, caught in the act! Got it on tape now Bob! Its YOUR fault, no YOUR fault!